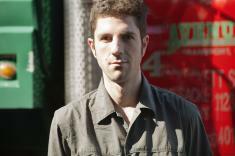 Saxophonist/composer Dan Blake has appeared on recordings and in performances with a staggering array of high profile artists, such as Esperanza Spalding, Anthony Braxton, Kenny Werner, Julian Lage, Herbie Hancock, Danilo Perez, and many others. He is currently in demand as a saxophonist, and is a regular member of Lukas Ligeti's Kaleidoscope Point, Peter Evans' Sparks Orchestra, and composes and performs with the Grammy-nominated Julian Lage Group. As a recording artist, Blake is a featured soloist on Grammy Award winner Esperanza Spalding's forthcoming Radio Music Society, Anthony Braxton's opera Trillium E, and a featured artist on Danilo Perez's Grammy-nominated, Panama Suite. Blake is currently a Ph.D. candidate in composition at the Graduate Center, City University of New York, and serves as adjunct lecturer in music history at The Conservatory of Music at Brooklyn College. He was recently awarded the 2010 Baisley Powell Elebash Fund for an ongoing research project examining New York City's improvised music scene. With Blake's The Aquarian Suite, recently released on Brooklyn Jazz Underground Records, you have a recipe for a wildly successful jazz recording; eight new jazz compositions for "chordless quartet" that stretch the boundaries of modern jazz while staying true to the forms set by the masters; a "Mingus meets Monk" quality of blues-inflection, compositional unity, and ever-present melodicism; and an incredible band comprised of Blake on tenor saxophone, Jason Palmer (Greg Osby, Kurt Rosenwinkel, Roy Haynes, Ravi Coltrane, etc) on trumpet, Jorge Roeder (Gary Burton, Julian Lage, Alex Acuna, Maria Schneider) on bass, and the ubiquitous Richie Barshay (Herbie Hancock, Esperanza Spaulding, Lee Konitz, Chick Corea, etc) on drums and percussion. While Blake's previous recording, The Party Suite, represents his own personal revelation that the history of early jazz is in fact a raucous celebration of life and the endless possibilities to experience joy in its many facets, The Aquarian Suite, "connects to the tumultuous and fertile energy of the bebop revolution, in an effort to further expand my understanding of tradition and how it relates to my life as a musician. By connecting to a rich musical heritage and claiming it as my own, The Aquarian Suite is for me a 'water bearer'; a sonic body through which a hopeful transition between tradition and the potential for a greater future can flow easefully and with great joy", states Blake. Most of the pieces on The Aquarian Suite paint a musical portrait of a different master of the bebop era. "The Whistler" is dedicated to Horace Silver, with a sparse and focused melody that is punchy, vibrant and full of mysterious simplicity. "Mister Who", takes a cue from Thelonious Monk's "Skippy". "This piece is a celebration of freedom in precision; that marriage of qualities, being together and independent at the same time. Always swinging yet persistently off beat," explains Blake. "The Best of Intentions" is a plaintive piece that begins with a lullaby, hinting at the more forlorn aspects of the suite. "How It's Done" builds from the poignancy of the previous piece into a blistering chromatic melody evoking the formidable Clifford Brown/Max Roach Quintet, "who in their brief tenure showed us all, 'how it's done'", says Blake. Other highlights on the recording include, "You Cry So Pretty", a ballad dedicated to Miles Davis; the title track, "Aquarian", which is "dedicated to Anthony Braxton, an icon of creative music. This piece imagines an expanded terrain for jazz improvisation", explains Blake; and the closing piece, "Epilogue: Cavemen Do It Too". Blake describes the meaning behind this composition, "I have long been a proponent of a rugged approach to performing, as I feel people can connect with those performances that abandon the overly self-conscious mindset in favor of the immediacy of now. This piece, and my music in general, is a celebration of that human ability to not take oneself too seriously, to enjoy life as it is. I imagine that quality has been around since the cavemen (and women), and whatever it is we do, we can be sure that the cavemen did it too!"